Thank you to all the participants who came out in support of New York State moms, dads, and families at the Zumbathon Charity event on Friday, April 10, 2015. We had a wonderful turn-out and the Zumbathon went on for two hours! Friday night's Charity Zumbathon supporting the mission of the Postpartum Resource Center of New York was an awesome event with inspiring people who generously raised $907! Thank you to everyone who came out to Zumba for an important cause of helping to increase awareness of pregnancy and postpartum depression/anxiety. To all those who supported us while Zumbaing - Elisa Zito, Nikki Zumba Neenan and the team of other Zumba Instructors, DJ Frankie J of Crowd Control Entertainment, Rise Above Fitness, Michelle Vaughan, Karen Romanelli and the many raffle donors a big thank you for making this fun event happen and for your support of the Postpartum Resource Center of New York! A very special thank you also to Julissa Zambrano - Mrs. Nassau County and Bridget Croteau - Mrs. Suffolk County for their participation and support! Afterwards, we also held a gift baskets raffle to add to the money raised during the event in support of the vital programs and services of the Postpartum Resource Center of New York. Below are some photographs from the event. If you were not able to attend, please know that we hold events throughout the year, so, please go to the "Events" menu tab to see others that will be taking place soon. 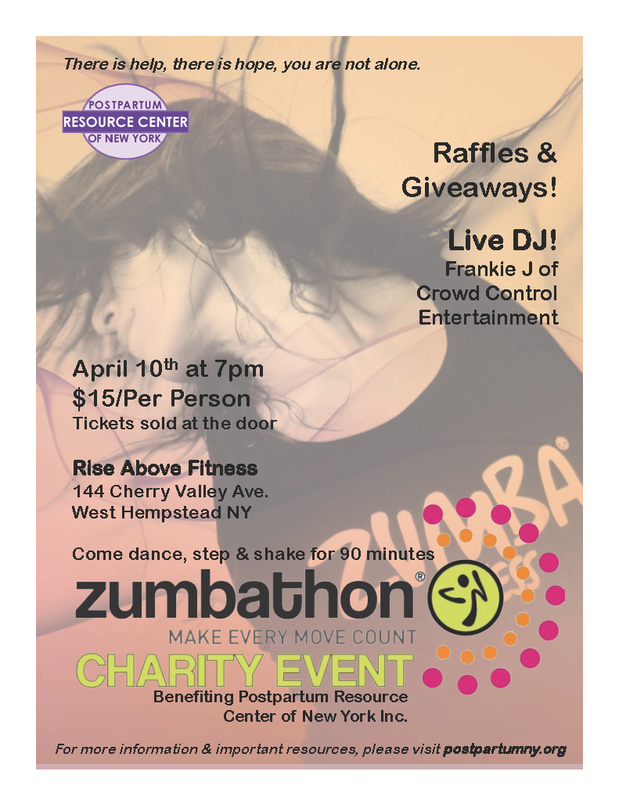 Come dance, step & shake for 90 minutes at Rise Above Fitness in West Hempstead, New York for this fun and healthy charity event benefiting the Postpartum Resource Center of New York. In addition to Zumba dance/fitness, this wonderful event also includes raffles, giveaways and a live DJ courtesy of Frankie J of Crowd Control Entertainment! Come join in the fun at an event that raises funds for an organization that helps our moms, dads and families that are at risk or experiencing a perinatal mood and anxiety disorder. The flyer is available in two formats: Zumbathon Charity Event (pdf) and Zumbathon Charity Event (.png).